The Alaska Personal Injury Law Group is dedicated to obtaining full, fair and just compensation for injured Alaskans. 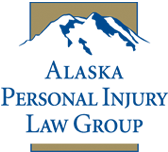 The attorneys of the Alaska Personal Injury Law Group have a combined 85 years experience helping injured Alaskans from across the state. They have honored that trust by relentlessly seeking the maximum compensation to which their clients are entitled. Money damages can never provide complete compensation for an injury or death. Damages can, however, lighten the burden of such injuries by replacing lost income, paying for necessary medical care, and providing an important measure of justice for those whose lives have been irrevocably altered, or tragically cut short, by the wrongful acts of others. The attorneys of the Alaska Personal Injury Law Group are all rated "A-V" by Martindale-Hubbell, the oldest and most respected attorney rating service in the country. These ratings are the highest available from Martindale-Hubbell for legal ability ("A" for high to preeminent) and for ethical standards ("V" for very high). The attorneys of the Alaska Personal Injury Law Group are also all listed in Best Lawyers in America. This rating is given only after thorough investigation and confidential peer evaluations. While the attorneys of the Alaska Personal Injury Law Group appreciate the rankings given to them by other lawyers, they measure their true success by the results obtained for each client they have the privilege to represent. The attorneys at the Alaska Personal Injury Law Group are all partners in the law firm of Atkinson, Conway & Gagnon, Inc. The firm is one of the oldest and most respected law firms in the State of Alaska. Founded in 1962, it has one of the highest percentage of "A-V" rated attorneys in the state. Atkinson, Conway & Gagnon, Inc., has a long history of providing comprehensive legal services to its clients, including the representation of personal injury plaintiffs, and the representation of small and medium size companies as plaintiffs in business and commercial claims. The Alaska Personal Injury Law Group recognizes that most individuals who resort to the legal system do so reluctantly and only seek what they deserve. To get fair and just compensation, however, victims of wrongful conduct often have to fight large insurance companies or huge corporations that have teams of expensive lawyers and vast resources arrayed against them. Winning a legal battle with these corporate giants requires experienced and committed counsel. It often requires hiring expensive nationally-recognized experts in various scientific and medical fields. It also requires legal counsel who have the financial resources to wage what often becomes a long legal battle. As the plaintiff's litigation group within a larger law firm, the Alaska Personal Injury Law Group at Atkinson, Conway & Gagnon has the economic strength, the technological assets and the trained support staff to litigate against large corporations and major insurance companies. Their remarkable track record of verdicts and settlements over the past three decades shows they are well-equipped to successfully fight for your rights. The attorneys at the Alaska Personal Injury Law Group represent individuals on a percentage or "contingency fee" basis. Under a contingency fee agreement, legal fees are paid on a percentage basis out of the recovery in the case. No legal fees are owed unless and until damages are awarded and collected. Hourly fee arrangements are also available. Contact us. We will discuss your situation, answer your questions, and help you protect your rights. There is no charge for an initial consultation.